Objective: The SAGES Global Affairs Committee has organized numerous international proctoring courses aimed at teaching the basic skills required to perform safe laparoscopic cholecystectomy. These courses require significant travel by SAGES faculty and staff in order to provide onsite teaching. 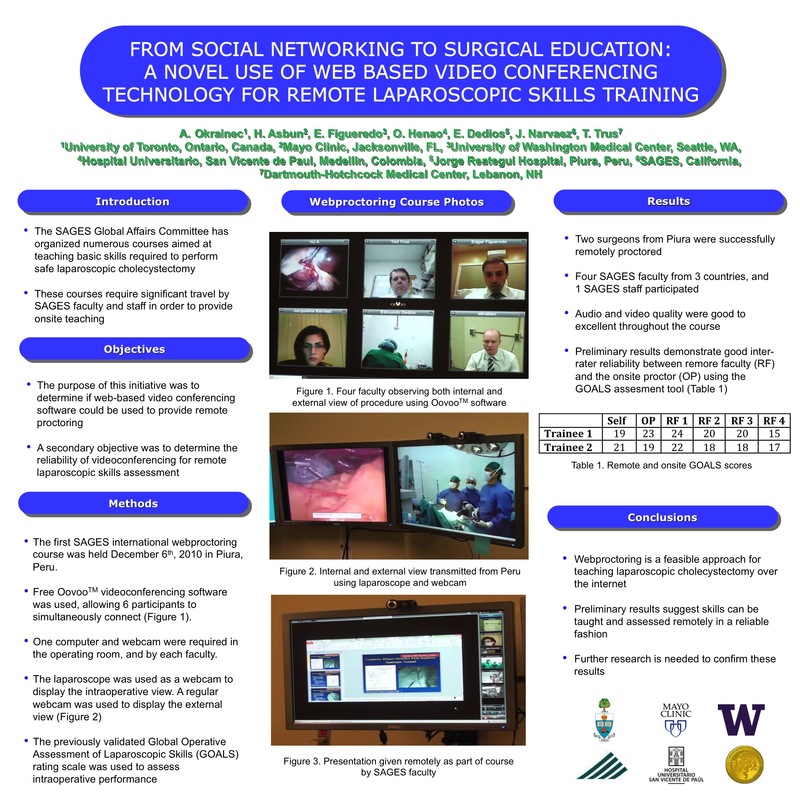 The purpose of this initiative was to determine if web-based videoconferencing software could be used to provide similar proctoring remotely. Description: The first SAGES international webproctoring course was held on December 6th, 2010. Free OovooTM videoconferencing software was used, allowing 6 participants/faculty to simultaneously connect and participate in the course. One computer and webcam was required at each faculty site. One computer and two webcams were required in the operating room of the participating site: one webcam displayed the room and patient view, and the laparoscope was used as a webcam to display the internal operative view. The previously validated Global Operative Assessment of Laparoscopic Skills (GOALS) rating scale was used by all participants and faculty to assess performance during the procedure. The course included the following components: two lectures outlining the basics of laparoscopic cholecystectomy; a live laparoscopic cholecystectomy performed and transmitted via webcam by a SAGES faculty in the U.S. in order to demonstrate the steps of the procedure and safe technique; subsequently each participant in Peru performed one laparoscopic cholecystectomy while being remotely mentored by the SAGES faculty. A local expert served as the on-site proctor. Preliminary Results: Two surgeons in Piura, Peru were remotely proctored. Four SAGES faculty, and 1 SAGES staff participated from 3 countries, including the United States, Canada, and Colombia. Video and audio quality were good to excellent throughout the course. Table 1 shows GOALS scores for each trainee. Preliminary results demonstrate good inter-rater reliability between remote faculty (RF) and the onsite proctor (OP). Conclusions: Webproctoring is a feasible approach for teaching laparoscopic cholecystectomy over the internet. Our preliminary results suggest skills can be taught and assessed remotely in a reliable fashion. Further research is needed to confirm these results.